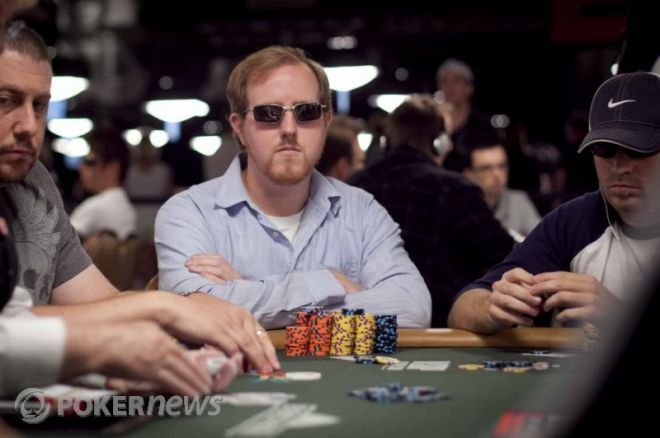 Andrew “Foucault” Brokos is an online cash-game pro who has an incredible track record at the World Series of Poker Main Event. Of the past five years, he cashed four times. He finished 279th in 2006 for $39,000, 361th in 2007 for $35,000, 35th in 2008 for $193,000, and is well into the money in the 2010 Main Event. He talks to PokerNews about an interesting hand he played on Day 3 this year. What had the interaction been between you and your opponent in this particular hand? Vince Van Patten had been sitting at my table since the beginning of the day, and I really hadn’t singled him out as someone I’d wanted to pick on, I just tended to have hands when he was in the pot or in the big blind. But he made it clear that he thought I was singling him out. He resented it, and thought I was picking on his blinds and reraising his raises, that sort of thing. I had the sense that he had it in for me and might try to take a pot from me. Ok, how did the hand start? So we ended up getting into a three-way pot. Someone had raised from early position, Vince called in late position, and I called with pocket eights out of the small blind. The flop came ten-nine-seven, giving me an open-ended straight draw with two overcards on the board. It checked around on the flop. Did you ever think about leading the flop? Not really, because I think it’s very tricky to play the hand on later streets if I bet. With a flop of that texture, especially with who the preflop raiser was, I don’t think he’d bluff at that flop. If he bets, I get a lot of information about his hand, and I get it for free by checking. If it checks around, I can be pretty sure that my eights are good. It’s just a flop texture where people are going to play very straight-forwardly. That’s interesting. Instead of betting for information, you’re checking for information. Yeah, that’s a good way of putting it. A lot of people think you have to bet to see where you are, but if you’re good at reading hands, a lot of times you can get the same information or information that’s almost as good, for a lot less money. What happened in the rest of the hand? The turn was a pretty innocuous card like a two or a three, something that didn’t change anything. It checked to Vince and he bet 20,000 which was close to the size of the pot. I called, and the third player folded. The river paired the nine, so the board was ten-nine-seven-X-nine. I checked, and Vince bet 30,000 fairly quickly. Now, I think that there are some people who are capable of value-betting a pair of tens there, but I sort of didn’t think that Vince was one of them. I also didn’t think he would have slow played anything on the flop. For him to have a full house or a straight, he would have had to slow-play something on the flop, which I just don’t think he would have done. I thought he either had a nine or he was bluffing. Seeing as though I was getting the feeling he had it in for me, I made the call and was right. The significant thing about that hand was that up until then, I’d gotten a lot of my chips getting my money in bad and sucking out. The first day, I was all-in with jacks versus aces and caught a straight on the river, that sort of the thing. This was the first hand I’d won a significant amount through pretty good play on my own part. That was the first time I felt like my play was making a difference. That was a good confidence booster for me. Can you explain why betting is not really an option on the river? I think betting the river is really not an option because he’s never really calling with a hand that is worse and I don’t want to stop him from bluffing. Even though it’s a tricky spot for me if he bets, ultimately I’m going to call and it’s a good way to induce a bluff. It seems like you really sensed his breaking point. As an online player, how did you learn to sense those things? You get a little bit of a sense of it sometimes online, like someone’s timing might change, but you really get it much more when you’re playing live. Sometimes you can just tell, especially with people who aren’t professional players or who don’t play a lot of tournaments. They just don’t keep their composure as well. A lot of them are really emotionally invested in the tournaments they do play because they are so important to them, especially a tournament like this. You do see peoples’ emotions run high. On Day 5, Brokos talked to the PokerNews video team about how his WSOP Main Event was going so far.